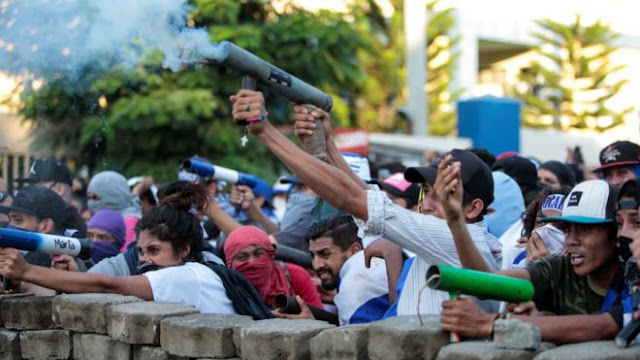 Home / .#Politics / # Riots / #AmericanRoadRadio / #Chronicles / #Human_Rights / #HumanRights / Human Rights / Nicaragua / #HumanRights :More than 100 people have died in Nicaragua since riots began fifty days ago.! 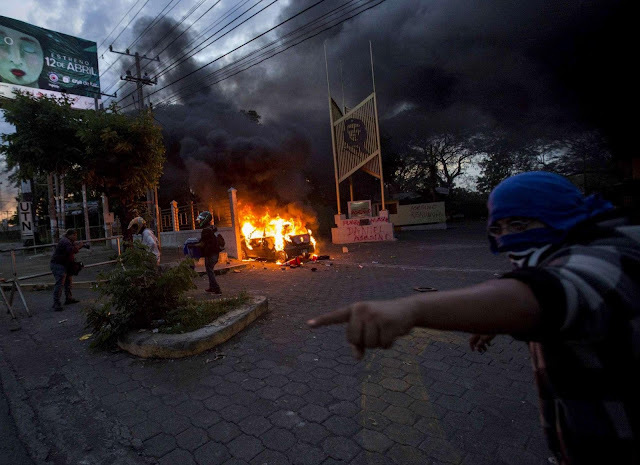 #HumanRights :More than 100 people have died in Nicaragua since riots began fifty days ago.! More than 100 people have died in Nicaragua since unrest began more than a month ago. Protesters have taken to the streets, demanding President Daniel Ortega stand down. Authorities have been accused of using "lethal force" to crack down on the protests. On Wednesday, hundreds of thousands of people took to the streets on Nicaragua's Mother's Day to honour the mothers of the students killed in earlier demonstrations. According to a rights group, 16 people were killed in what became one of the worst days of violence since protests against Ortega started. Demonstrations began on April 16, led by university students in Managua after the government failed to handle forest fires in one of the most protected areas of the Indio Maiz Biological Reserve. Two days later, the government introduced plans to cut pensions and social security, including decreasing pension payments by five percent and increasing worker social contributions by 0.75 percent. The change also increased employer contributions by 3.5 percent. "I'm [protesting] because I'm indignant that my grandparents are going to receive five percent less of their already anemic pension, after having worked for 44 years, that's not money they are being lent, that's money they have paid in, so it bothers me," Pablo Sanchez a protester told A.J. agency during the early stages of the protests. Sandinista Youth, a group aligned with Daniel Ortega's Sandinista National Liberation Front (FSLN), launched counterprotests in support of the reforms. The government cracked down on the protests, and several people were killed, including journalist Angel Gahona, who was shot dead while reporting on the protests live on Facebook. The first fatalities were reported on Thursday, April 19 when two civilians and a police officer were killed in clashes. The same day, a number of television outlets were reportedly taken off the air. "These are acts of repression and unexplainable censorship by the government, the government has been very secretive in releasing information to the public, but this censorship is at a new level,"
Miguel Mora, director of 100% Noticias, told Al Jazeera at the time. The government maintained that the Nicaraguan Social Security Institute (INSS) was very close to insolvency and that if changes were not made, it would end without liquid assets by 2019. 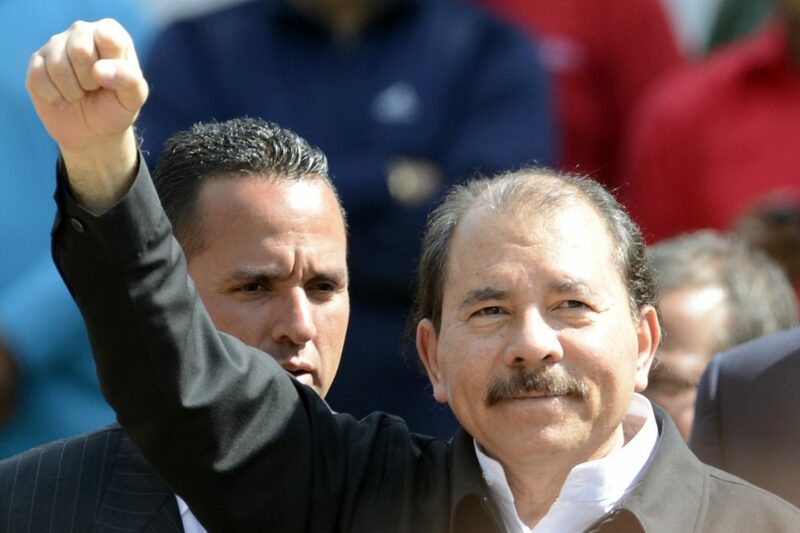 Ortega, the last of the Latin American revolutionaries still in office, called for renewed dialogue with the private sector over the social security reform and welcomed modifications to implement the reforms "in a better way". But in a televised meeting, aired on April 22, President Ortega scraped the controversial reforms. In the meeting, Ortega denounced protesters for acting like "gangs killing each other". "We must re-establish order, we will not allow chaos, crime and looting to reign," he said. Due to the heavy-handed tactics used by the government to curb the demonstrations, tens of thousands of people continued to protest, demanding Ortega's resignation. "We are fighting not only for the INSS, we are fighting for all those years of pillaging of the people by the Sandinista regime," an engineering student in Managua who identified himself as Cristofer told AFP news agency during the protests. Ortega's government has faced condemnation in recent years over plans to build an inter-oceanic canal, for hobbling political rivals, and consolidating power when his wife, Rosario Murillo, was elected vice president in 2016. Ortega has been elected three consecutive times since 2007 after serving a first presidential term in the 1980s. The UN has called for access to investigate the deaths and has accused the government of using excessive force. On May 29, Amnesty International released a report accusing the government of working with pro-government armed groups to suppress the protests. It also said authorities "adopted a strategy of repression, characterised by excessive use of force and extrajudicial executions". Nicaragua's Catholic church was serving as a mediator between the government and the protesters, calling for a reduction of hostilities and dialogue and issuing an ultimatum to the government to push for international oversight. Talks between the government and opposition broke down in mid-May. On May 31, the church issued a statement saying it would not resume talks while the Nicaraguan people "continue to be repressed and murdered". Nicaragua's main business lobby urged President Daniel Ortega to hold early elections to steer the country out of weeks of destabilising protests, which again sparked deadly clashes on Wednesday, human rights groups and local media said. This week, the Organization of American States and the Inter-American Commission on Human Rights said they would investigate the unrest. Ortega told supporters that Nicaragua "is not private property" in response to the demand, according to local newspaper La Prensa.